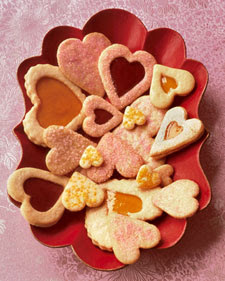 Here's a last minute Valentine cookie recipe from Martha Stewart. I've seen that a lot of bloggers out there don't really celebrate Valentine's Day or don't spend a lot of money on gifts. Well, in lew of gifts you can also make your family or significant other an extra special treat. Arrange these in a gift basket or platter, add sticks to make a cookie bouquet like the ones I posted on yesterday, or simply have your family eat them straight off the baking sheet. Either way this recipe is a good choice for Valentine's Day. This recipe can be used to make plain shortbread cookies or jam cookies, and after Valentines is over, just get out some other cookie cutters to make these cookies for any and all occasions. In bowl of electric mixer fitted with the paddle attachment, cream butter and sugar until fluffy, about 4 minutes. Add eggs, one at a time, beating well after each. Sift flour, baking soda, and salt into large bowl. On low speed, gradually add flour mixture to mixer bowl, alternating with buttermilk, until combined. Wrap dough in plastic; chill until firm, 1 hour or overnight. To color white sanding sugar, if using: Place a few tablespoons in a small bowl. Mix in petal dust with a toothpick, a bit at a time, until desired shade is reached. Colored sanding sugar will last indefinitely. Heat oven with two racks centered to 350 degrees. Line 2 baking sheets with parchment paper. On lightly floured surface, roll chilled dough 1/8 inch thick. Cut out hearts using any 1- to 3 1/2-inch heart cookie cutters. If desired, cut centers out of some hearts. Transfer with spatula to baking sheets. Chill for 30 minutes. Sprinkle with sanding sugar, if using. Bake until just golden but not too brown, about 10 minutes. Transfer cookies to rack. Continue with dough; reroll scraps. To make sandwich hearts: Brush bottom heart lightly with jam; cover with a second heart with center cut out; jam will adhere hearts. Fill cut-out area with more jam. Cookies will keep, in an airtight container, at room temperature for 1 week. Gorgeous cookies!! I was going to make cookies last night, but realized that I did not have enough flour!! So no Valentines cookies today! Wishing you a very Happy Valentines Day Jerri! I love the variety of heart cookies you made! They look so great together.